During the time I was reading The Collected Stories Of Richard Yates I happened to come across a review of the book in a book of reviews by Joyce Carol Oates, which proved that she is as clueless about writing as she is about painting. Of course, given the three books she started and completed the week she wrote that essay its a wonder she actually even was able to recall his name. At least she spelled it Yates, not Yeats. Basically, Oates compared Yatess stories to the paintings of Edward Hopper and F. Scott Fitzgeralds stories to John Singer Sargent. These are good metaphors since Hoppers paintings are rich, mysterious, and reward the viewer upon each time it is seen- sort of like Yatess best. Fitzgeralds tales, however, a stiff, dull, and trite, sort of like Sargents portraits. So, what does Oates do? She asserts Fitzgerald and Sargents superiority to Yates and Hopper. Now, there is no serious art historian that would take Sergeant over Hopper, but Oatess gaffe illustrates not only what is wrong with modern fiction but also what is wrong with its criticism. Like Sargents paintings, Oates and readers and writers like her want tales void of depth and duplicity. They do not want to be challenged. They like lazy art. Thankfully, Richard Yates did not. And, not content with a good metaphor being blown, she also tries to link Yates to the wooden grotesques of Flannery OConnor. Yates is far superior to OConnor but, that said, he is not a truly great writer- merely a quite good one, yet thats better than most. The writer he has most truck with, though, is J.D. Salinger. Like Salinger, Yates writes of the mid-20th Century New York, but does so with far more realism, and his tales are not hamstrung by the poseur sense of artifice that inflict Salingers tales. The book is divided into three parts. Part one are eleven tales from Eleven Kinds Of Loneliness, published in 1962, part two is seven tales from Liars In Love, from 1981, and part three has nine uncollected stories. The sections are all quite stark, as well. The Loneliness tales are hit and miss- with a few very good tales, and some mediocre ones, while the growth in Yates as a short story writer in the book from two decades later is stark. The tales are longer, less plot contrived, and are richer in depth and detail. The uncollected stories should, for the most part, have stayed uncollected. There is a reason writers or musicians dont include everything they create in their official works. The book opens with a mind-numbingly bad 'Politically Correct' introduction by Richard Russo called, ugh, Secret Hearts. Russos misunderstanding of what makes Yates a good writer is astounding. I suspect that part of his misunderstanding is Russos own stolidity, but also a part of the wholesale misreading of the Brokavian Greatest Generation nonsense thats been around the last decade and a half. Apparently, surviving the Great Depression and World War Two are bars from critical thinking for many, even though that generation did nothing to stop Jim Crow or the internment of Japanese-Americans. Yatess work explodes that mythos far more potently than the stiff, delimited Salinger- showing it as just as capable of greed, sloth, bigotry, and self-destruction as any other. Ironically, though, even as Yates demystifies that mythos someone like Russo doesnt get it, and deifies Yates uncritically, for the very same reasons. Right there is a sense of irony that goes wholly over Russos head. That clueless folk like Russo and Oates are feted in contemporary literature says far too much about its shortcomings. Yet, Yates, more than any other writer whose response criticism Ive searched out, seems to have been saddled with bad critics. One critic, who actually thought well of Yatess prose, actually wrote this sentence: His prose is so easy and natural and transparent that it suggests a profound humility before lifes inscrutable sadness. What exactly does this mean, save the writers angling for a book blurb? Oh well. As for Yatess tale, luck is definitely not an illusion, its in fact a guiding principle, as the story tells us most emphatically, and the sergeant that does not get this finds himself on the short end of the stick. The rest of the tales in that collection are hit and miss- not too good, nor too bad, but with glimmers of potential in each one. The tales from Liars are much better. They are generally of the slice of life variety and work on no more than two levels, but the levels are usually rich with small details, and the tales ends are strong. The worst tale is still quite good. The two best tales, the titular Liars In Love and A Compassionate Leave, are both set in London. In the former a separated American writer finds comfort with a London Prostitute, and their interaction is quite believable. I was reminded of a story by John Updike, in a very similar vein, and how stiff, and devoid of insight into the characters and the reality of the situation that tale was. Not so with Yates, who ends his tale magnificently. The latter tale follows an American soldier on leave in London, and looking to get laid. He meets up with his sister and their congress (of the non-sexual kind) is touching and revelatory. The next tale, Regards At Home, is also very good, although it ends one paragraph too late. 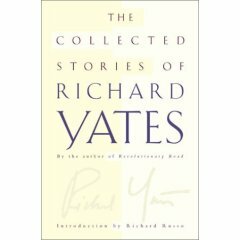 The uncollected tales are not very good- most are moment-pieces, unpolished, and read like drafts-in-progress, rather than finished stories of the order of what Yates achieved in Liars In Love. They are like jam sessions not good enough for an official album. The lone exception is The Comptroller And The Wild Wind, an exemplary portrait of a dying male ego. Overall, Yates is a very good writer, at his best, which is much better than many short stories from far bigger name writers like Fitzgerald, OConnor, Faulkner, Salinger, and the like. Yet, he never quite breaches greatness in any of the stories. They lack an X Factor- be it a great end, a tale that works on multiple levels, or a sustained lyric impulse to his descriptions and metaphors. Some critics have cited him as an influence on Raymond Carver, and there is certainly a linkage in the tales, but Carver achieves greatness in quite a sizable number of his tales, because he is daring, and risky. Yates, for all his skill at portraying the yearning nobodies of life, is a safe and steady writer, yet his best lines and tales seep inward like the best of writing does. He has no abominable tales, like Carver does, but his best pales to Carvers best and it is always the best of an artist that is remembered the longest. Too bad.